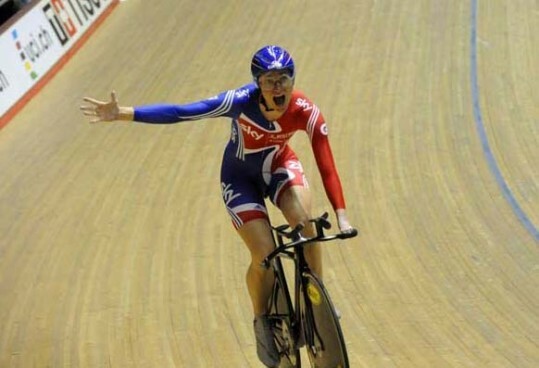 Wendy Houvenaghel, Joanna Rowsell and Sarah Storey were within an ace of breaking the team pursuit world record as defeated New Zealand to clinch Great Britain’s first gold medal of the weekend. The British team’s time of 3-19.757 was just a quarter of a second outside the world record, held by the USA. Afterwards Rowsell predicted that it might take a time in the region of 3-17 to win the World Championships in the Netherlands next month. 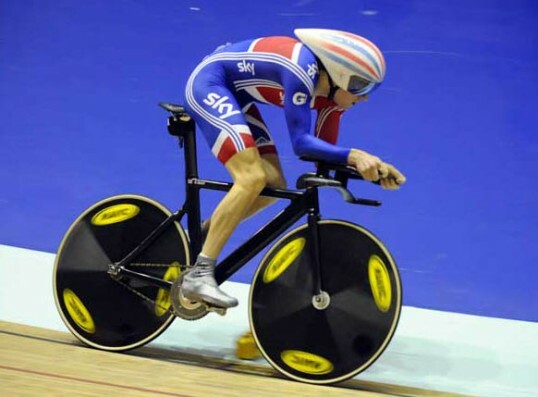 Sir Chris Hoy and Jason Kenny clashed in an all-British, all-Sky semi-final in the sprint competition. With only one place for each nation in the sprint at next summer’s Olympic Games, this was the beginning of an 18-month battle between the pair to decide who should take that place. The 22-year-old from Bolton took a surprisingly comfortable win in the first race, after leading from the front. And he had to come from behind to win the second. In the final, Kenny succumbed to Frenchman Kevin Sireau, the best sprinter in the world at the moment, despite winning the first race in style. Sireau struck back to take the gold medal, although the decider was very close, with less than a wheel length in it. Hoy took bronze by beating Germany’s Maximilian Levy 2-0. Australia have not brought all their big hitters to Manchester for the final World Cup round of the track season, but they had a successful opening night. Rohan Dennis pipped Geraint Thomas in a thrilling individual pursuit final. The Welshman held the balance of power after a blistering start, which had him on course to break the world record that was recently set by Aussie Jack Bobridge. That was until the final kilometre when he began to fade and Dennis turned the screw to win in a time of 4-15.614. The Australian world champions Kaarle McCulloch and Anna Meares won the team sprint in typical fashion, beating the Chinese pair in the final. Britain’s team of Jess Varnish and Becky James did well to qualify for the bronze medal race, with Varnish setting a personal best for the opening lap. Although they were beaten by the experienced French team of Sandie Clair and Clara Sanchez in the final, it showed that there’s great strength in depth. 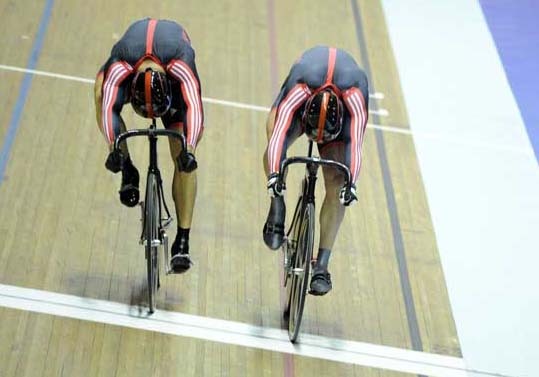 Sky’s team of Victoria Pendleton and Shanaze Reade surprisingly failed to qualify for a medal ride after they failed to break the 34-second barrier – admittedly only less than the blink of an eye – with a time of 34.001. Pendleton false started and they were unable to find the speed they needed. After a gruelling first day of competition, Ben Swift was left to rue his misfortune in the points race which threatened to knock him out of contention in the omnium, which concludes on Saturday. Having finished outside the top ten in the flying lap – not one of his strongest events – he had been expected to get back on track in the points race. However, the bunch split in two midway through the race and Swift was on the wrong side of the split as the leaders managed to gain a lap. He managed to overcome some of that frustration with a great ride in the elmination race, surviving until the very end before being pipped into second place by the Italian Elia Viviani. With three events remaining, Swift lay sixth in the omnium but had a lot of ground to make up to get back into medal contention.